How is summer coming along? I hope you enjoyed reading my last post on styling maxi’s. 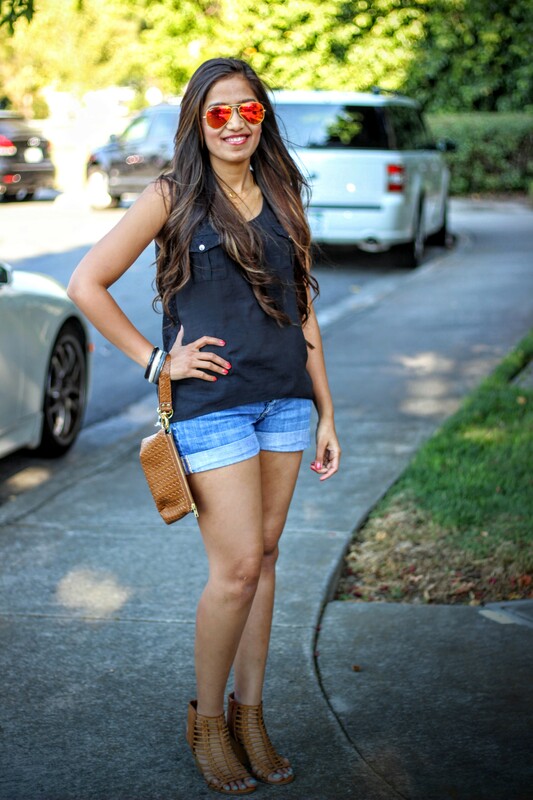 Today I will be talking about how to style shorts for summer. Denim shorts are a must have wardrobe essential for summer and it’s really important selecting the right fit for your body type. Today I will be talking about dressing up this look a bit, so that you look fashionable and chic in those casual shorts. Styling Tip 1: If you’re hourglass shaped like me or if you just want your legs to look slimmer, opt for loose fitted shorts or go a size up so that you leave some space between your thighs and the fabric giving the illusion of slender legs. This is pretty much my to go summer outfit. I live in these comfy boyfriend shorts in summer. I hate shorts which stick to my skin and I always buy them atleast 1 – 2 sizes up. 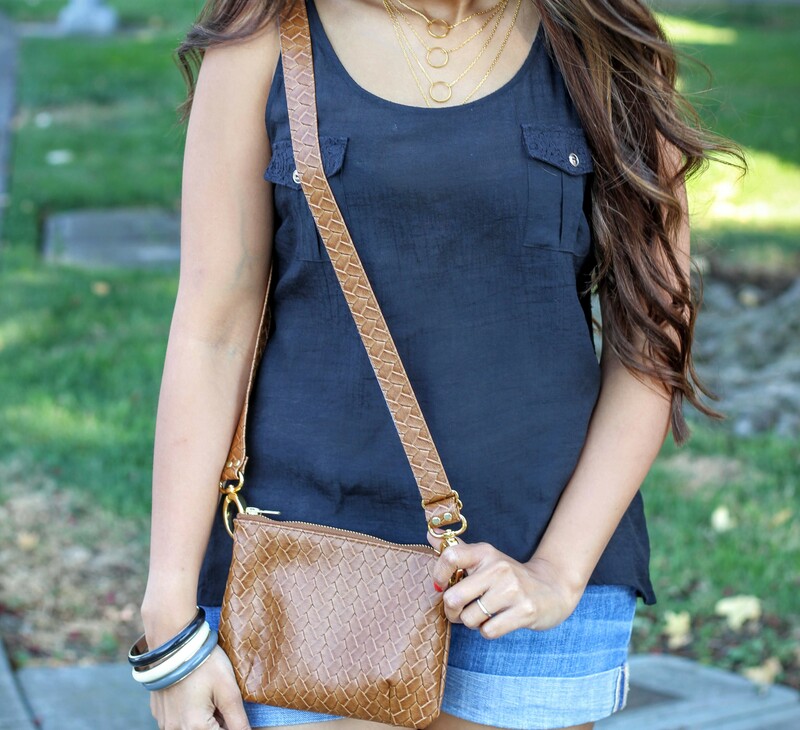 Styling Tip 2: Pair shorts with loose and long tops and accessories for that boho chic look and to dress it up. 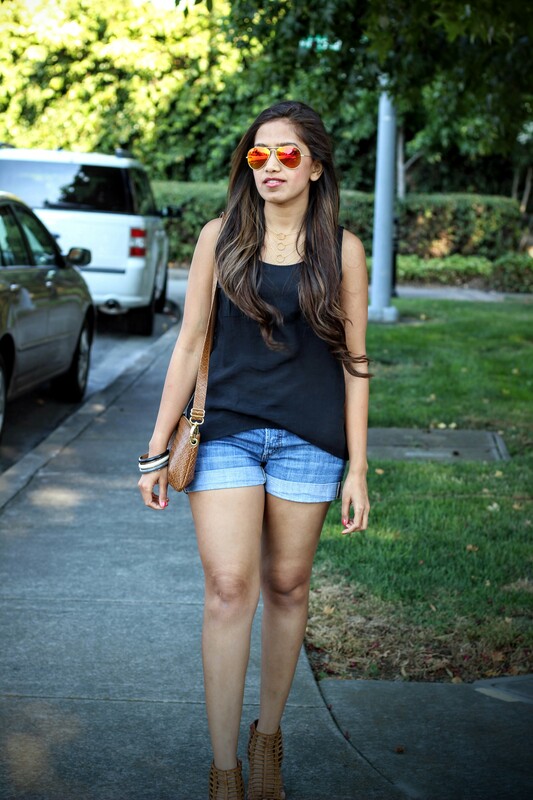 You can wear shorts a number of ways – with shirts and sneakers, with a loose fitted off shoulder top and a heavy necklace or with a nice tank top and a layered necklace. If you’re having a bad hair day, you can even tie it up in a bun and look super cute. The black tank top I am wearing is from a store called A’GACI . It’s very airy and has small holes at the back as the design making it perfect for those summer afternoons. I even wore this with pants. Check my blog-post here. Styling Tip 3: Although, it’s fun playing with colors in summer, in order to make each accessroty stand out, match the colors of your shoes and bag for a co-ordinated yet fun look. Styling Tip 4: Style a basic outfit (such as denim shorts and a black top or blue jeans with a white top) with reflector aviators for a chic yet sophisticated look. I’ve kept my accessories very minimal with this look. The bangles I am wearing are from Express and the layered gold necklace is from Sammy’s Dress. I love the delicate yet chic look of it. I wore orange Rayban aviators to complete the look as my outfit had very basic colors. 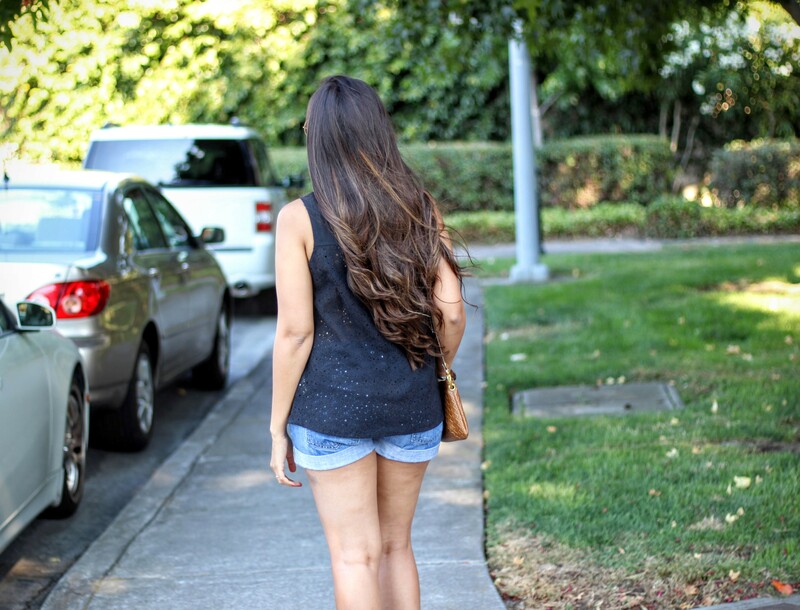 Styling Tip 5: Hair extensions in summer are a great idea for that edgy look. Since I am too lazy to tie my hair up in a nice big bun, I left it down. But if you want to create voluminous hairstyles such as braids or buns, hair extensions are a great idea for summers. I am also wearing my super fun Irresistible Me hair extensions. I love how these add more volume and length to my hair. Read my full blog post on these extensions here. You look sooo pretty girl! Love those shades and shoes! And the tips are perfect for creating a balance when wearing shorts. Ahhh those hair extensions are taking this look up by another notch <3 Have a great week! 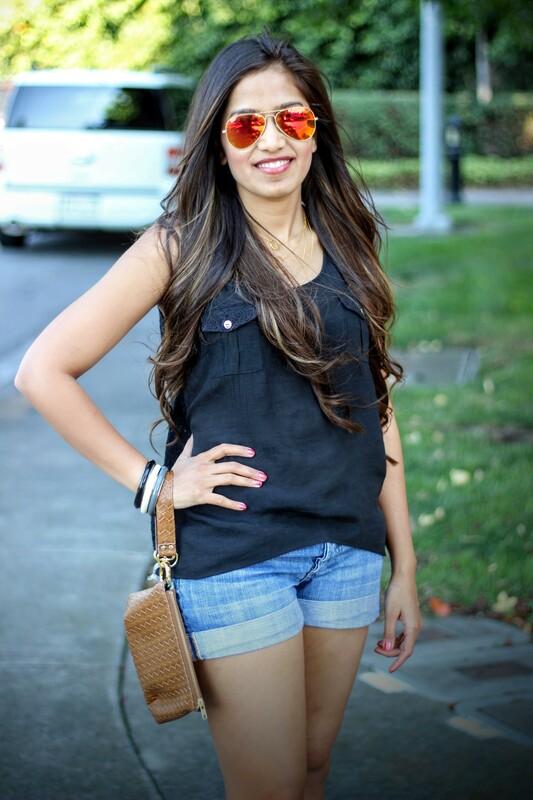 Ankita those were some really cool tips for styling shorts.I loved your neckpiece.Great post dear. I also loooove your hair! You are looking so pretty. Love your outfit. Great tips! Cute necklace. Have a great weekend!